Where can I get Costume SuperCenter coupons? Before you start shopping, visit Valpak.com for a Costume SuperCenter discount code you can use to help you save. Pay less for the best costumes that are already put together for you or create your own from their vast assortment of masks, fangs, wigs, makeup and other accessories and props. Are they exclusively a costume store? No, Costume SuperCenter also sells Halloween decorations and props including animated and motion activated décor. Pick up body parts, skulls, skeletons, spider webs, tombstones and rodents – ideal to deck out the place for a Halloween party or for the trick-or-treaters. Where can I read Costume SuperCenter reviews? Directly on their website! 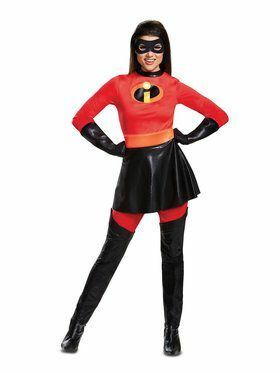 Go to www.CostumeSuperCenter.com and click on the “Costume SuperCenter Reviews” link for testimonials, comments and easy-to-see star ratings. What Halloween costumes are new for 2018? They’ve got Incredibles 2 costumes for every member of the family, in addition to Jurassic World dinosaur costumes and awesome Black Panther costumes. All are sure to be popular choices this Halloween. What sizes are their costumes for kids? Because they have the largest collection of costumes for children and adults, you can expect to find baby, toddler, boys, girls and teen sizes – as well as adult men, women and plus sizes, too. They also carry dog costumes and cat costumes, so your pets can dress up too. Economy shipping is your best way to save. They charge a flat rate of $7.99 for economy shipping, so that's a good way to save money on delivery of your order. If you need it quicker, you'll pay a minimum of $9.99 plus additional costs if you need it even faster. Ten days to return costumes. Read their return and exchange policy so that you are aware of any restrictions when sending back merchandise. They give you 10 days to return unworn costumes, so be sure to try it on as soon as you receive it. Worried you won’t receive your costume or order in time? Use their convenient online in-home delivery calculator to see when you can expect to receive your order based on all available delivery options. Just enter your zip code and they’ll show you exactly which days your order will arrive when using standard or any of the expedited shipping methods. Valid on orders $20 or more. Enter the code provided at checkout, some exclusions may apply, see site for more details. Click this link to create your own costume. Restrictions may apply. Click this link and get $7.99 flat rate shipping on orders under $75. Restrictions may apply. Click this link to get 30% discount on all orders with Costume SuperCenter email sign up. Includes free shipping. Restrictions may apply.